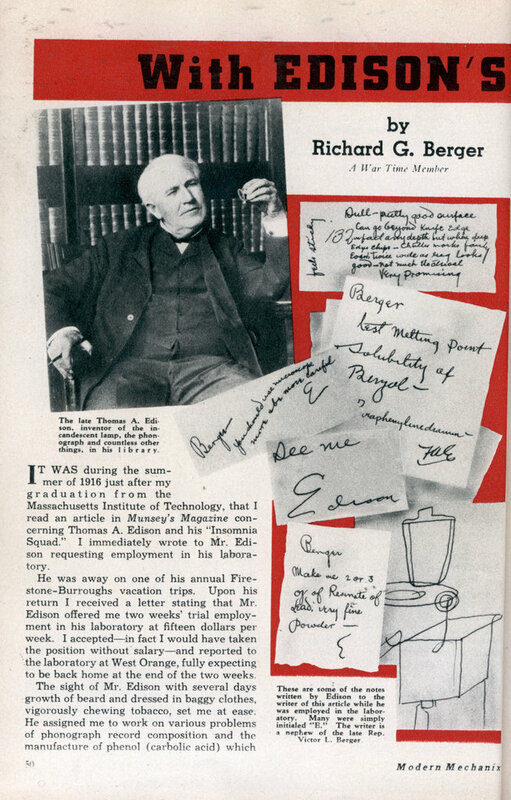 IT WAS during the summer of 1916 just after my graduation from the Massachusetts Institute of Technology, that I read an article in Munsey’s Magazine concerning Thomas A. Edison and his “Insomnia Squad.” I immediately wrote to Mr. Edison requesting employment in his laboratory. He was away on one of his annual Firestone-Burroughs vacation trips. Upon his return I received a letter stating that Mr. Edison offered me two weeks’ trial employment in his laboratory at fifteen dollars per week. I acceptedâ€”in fact I would have taken the position without salaryâ€”and reported to the laboratory at West Orange, fully expecting to be back home at the end of the two weeks. The sight of Mr. Edison with several days growth of beard and dressed in baggy clothes, vigorously chewing tobacco, set me at ease. He assigned me to work on various problems of phonograph record composition and the manufacture of phenol (carbolic acid) which was then much in demand for both records and explosives. Mr. Edison saw that I had plenty of work to do, and rewarded my solved problems by giving me twice as many new ones. He would lecture in his direct way on the evils of smoking cigarets, and of watching the clock. In fact, he would become quite angry at employees who quit work on time. I discovered also that he relished good stories. Some of his men liked him. Many of them feared him. A few even disliked him. Some of the married men maintained that the long hours of work in the laboratory destroyed their home-life. Edison was dictator and labor turnover was terrific. “What degree is it?” I asked. That same night, as he seemed loquacious, I expressed a desire to be a Nobel Prize winner. He informed me that I couldâ€”if I worked hard enoughâ€”and added that he himself would have been awarded a Nobel Prize except that he wouldn’t comply with the necessary regulations and couldn’t be bothered to travel to Sweden to call for it. People have been curious sometimes concerning the Edison manner of experiment. There is no secret about it. It was the “try everything method”â€”that is, the process of exhaustion. I give an example which occurred to one of the other experimenters during my term of employment. Edison wanted very finely divided silver for use in place of graphite for electrodeposition during record manufacture. The chemist tried numerous methods of making finely divided silver and finally sent a report to Mr. Edison, who was ill at home for a few days, that silver as finely divided as Mr. Edison desired could not be made, that he had tried 40 methods without success. I saw the report returned with this memorandum on it, “Keep on trying. There are 17 million chemical compounds you haven’t tried yet.” A few days later this experimenter was discharged and given just one hour to leave the premises. However, the chief resentment of men working in the laboratory was the lack of public recognition which seemed to be their lot. They might have become reconciled to meager salaries had they been accorded due credit for important processes which, from time to time, they perfected. I hold no brief for them. Perhaps Mr. Edison deserved all the recognitionâ€”anyhow he got it. The superintendent of disc record manufacture had a friend, a chemist Ph.D. from Yale, who desired a position with Mr. Edison. The latter spoke to him and then told him he could have work at $10 per week. The learned Doctor of Philosophy seemed stunned. Later Thomas A. asked the superintendent if his friend had accepted. The superintendent replied that he couldn’t afford to accept. Once I was making a demonstration of a fire extinguishing fluid before Mr. Edison and other spectators. I had a miniature model and was trying to extinguish a coal fire aboard a warship. I drenched Mr. Edison and ruined his clothes. It wasn’t intentional. He just got between me and the fire. Mr. Edison took it good naturedly and laughed with the spectators. It was 11 o’clock at night but I went into the laboratory and started my experiments. The “old boy” was right; I had some good results before I went home the next morning at 4 a. m.
I was warned to beware of “black goo”â€”the black residue left after phenol manufacture in the stills, to the extent of about 100 pounds daily. I was informed that several experimenters had been discharged for failure to find out what it was. Imagine my horror when one night Mr. Edison walked in followed by a laborer carrying a 50-pound box of black goo and asked me to identify it as he thought it was valuable. I worried and worked for 10 days and nights. Maybe you don’t know what a vacuum distillation is, and don’t want to know, but it was my salvation and brought me a substantial increase in salary. Some of Mr. Edison’s terms to his workers, including myself, depending on conditions and his mood were “My dear boyâ€”” “Damn fool!” , “You’re off your nut.” But he was busy and intensely human. The four – hours – of – sleep – per – day – or – night legend had a basis but the four hours were four hours at one stretch and did not include the dozens of catnaps taken during the day. The experimenters had to keep on working as they could never tell when he would suddenly open his eyes and be wide awake. The transition was rapid. 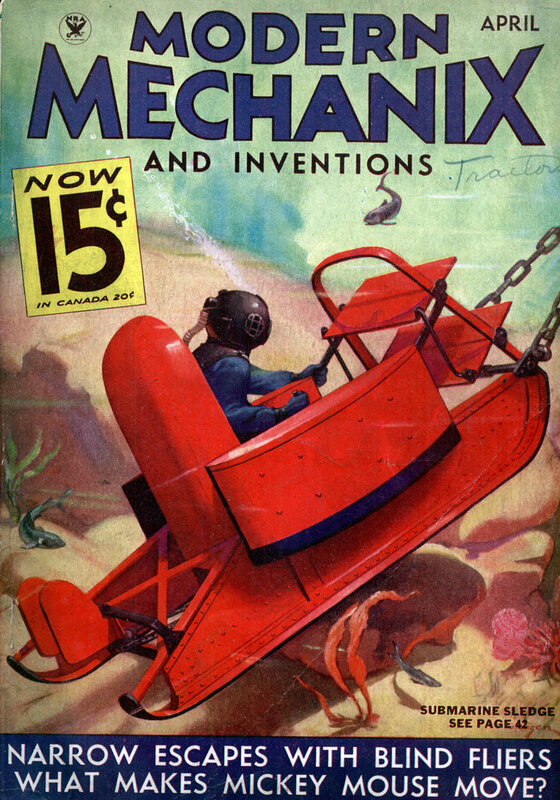 One of the things Mr. Edison disliked intensely I was riding in a closed automobile. He used to say it made him feel as though he were locked up in a closet and unable to get out. with some policies. This was almost disastrous, and as a result he was sometimes pinched for money. Lest this statement be challenged, I will give an example which occurred in the phonograph record industry. Mr. Edison disliked jazz records and many forms of popular comedy records and ruled them out. Instead he prescribed opera music but would not permit the names of the stars on the records. Stars are temperamental, and they signed up on exclusive long time contracts with competing companies. As a result the Edison records were not selling at all well and by the time that Edison tried to sign up the stars, only the second raters were left. My last assigned problem in the Edison Laboratory, after 10 months of experience, was Mr. Edison’s order to make material for smoke screens for aeroplanes in a certain explicit manner. Foolishly I disobeyed orders and substituted another method which I thought was preferable. When Mr. Edison discovered this he was furious and told me so in no uncertain terms. A short while later the paymaster visited meâ€”although it was not pay-dayâ€”and gave me a dividend of two weeks’ extra pay and the usual one hour to leave the premises. A few days later the U. S. Navy gained another recruit.